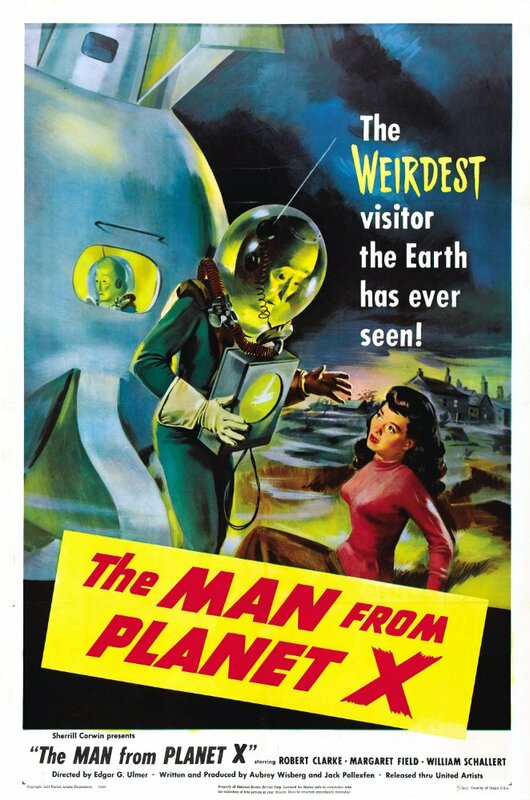 The 1950's sci-fi movies nearly always had a way of slipping in the fear of Cold War politics into its movies and with THE MAN FROM PLANET X that fear continues. Not so much because of an imminent war but because of there being a foreign entity invading. A new planet shows up in our solar system and scientists name it Planet X. Reporter John Lawrence gets invited to Professor Elliot's Scottish island laboratory to relay the story to the world. At the remote abode lives the delightful Enid Elliot, daughter of the professor and Dr. Mears a man with a shady past. They soon discover a spaceship has crash landed nearby and investigate what the creature inside is on Earth for. Is it friend or foe? Through the power of mind control it slowly takes over the inhabitants of the island in a hope to get its ship free. Of course the only way to stop this alien from taking over the whole world is by getting the military involved and blowing up the ship and the creature. This also stops Planet X from crashing into Earth and saving everyone. A happy ending for all.....well except the alien. Prepare to be terrified by the face that will haunt the Earth forever. Ok maybe that is stretching the truth a bit as the alien in this B-movie is not scary at all, although his paper mache face is something to make any movie art department cower in fright. This is well acted by all involved and even actress Margaret Field (yes she is the mother of Sally Field) is actually allowed to be a major character instead of the usual screaming pretty face as seen in so many of these types of movies. This wouldn't be the only 'alien invading' type movie to come out in 1951 as possibly the more famous (and definitely more enjoyable) THE THING FROM ANOTHER WORLD came out mere months later. It is worth noting that director Edgar G. Ulmer also directed the Universal Studios, Boris Karloff starring 1934 film THE BLACK CAT. This is possibly why THE MAN FROM PLANET X has an eerie looking foggy setting often seen in the classic Universal horror movies. He would also later direct THE AMAZING TRANSPARENT MAN in 1960 which is worth a watch. Put this 1950's sci-fi on your to watch pile as it does have its moments that will satisfy B-movie aficionados.